NDA (II) 2018 SSB Interview Registration has been started. SSB (Service Selection Board) is an organization which is set-up by the Ministry of Defence, India. Service Selection Board is the body that schedule, organize and conduct the SSB Interview of the candidates applying for Indian Military Forces. 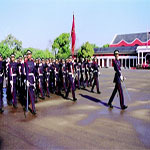 SSB Screens the candidates for the Army, Navy and Air Force. SSB Interview is five days long procedure which includes two stages of testing as stage I & stage II. This procedure will be organized at the SSB Centers (designated by SSB). SSB Interview also includes Intelligence & Personality Test. Here, we have updated the complete details about SSB Interview which includes updates for SSB exam, preparation tips & books, SSB Interview dates and SSB online procedure. NDA (II) 2018 SSB Interview Registration has been started from 8th December 2018. Click here to register. Note: SSB Dates NDA-142 & NA-104. SSB Centres/dates will be allotted online, on or before 19th December 2018. Dates has been announced for NDA 2018 (I & II) Examination. Candidates applying for the Army/Navy/Naval Academy and Air Force have to secure the minimum qualifying marks separately in written test & Officer Potentiality Test. Candidates applying for the Air Force, they also have to qualify the Computerized Pilot Selection System (CPSS) & Pilot Aptitude Battery Test (PABT) separately. PABT Test is applicable for the candidates those First choice is Air Force. PABT is also organized for all SSB qualified candidates with one of the choices as Air Force. Pilot Aptitude Battery Test (PABT) is a unique test. Its aim to assess a candidate’s aptitude to be trained as a pilot. Candidates can only take PABT once in a lifetime. PABT consist of three tests, i.e. Instrument Battery Test (INSB), Control Velocity Test (CVT) and Sensory Motor Apparatus Test (SMA). SSB Interview will be scheduled for the qualified candidates followed by upper given exams. It is necessary for all qualified candidates to appear in the SSB Interview round for final selection. The final selection will be made on the basis of the marks secured by the candidates in the examination & SSB Interview. Candidates have to report for SSB rounds on the date intimated to the candidates in the call letter for interview. The SSB interview consists of two stages i.e. stage I and stage II. The stage (I) will consist of Officer Intelligence Rating (OIR) and Picture Perception & Description Test (PP & DT). The stage (II) will consist of Interview, Group Testing Officer Tasks, Psychology Tests and the Conference. These test will be organized over 4 or 5 days. The entire process will carry 900 marks. Stage 1: This stage consists of Officer Intelligence Rating (OIR) tests and Picture Perception & Description Test (PP & DT). Stage 1 is a screening test. Candidates will be shortlisted on the basis of combined performance in OIR Test and PP & DT. Stage 2: This stage is conducted for four (4) days. Stage II consists of Psychology Tests, Group Testing Officer Tasks (GTO Tasks), Interview & Conference. On this day, candidates have to report to the selection center. Candidate’s original documents along with photocopies will be verified. After the documents verification, Personal Information Questionnaire (PIQ) Forms will be filled. PIQ Forms: In this form, candidates have to fill their personal details regarding educational profile, family background, etc. This form is very important. It forms a base of questions, which might be put to an aspirant at the individual interview round. The responses will be analyzed by the psychologist of the Board. On the next day, it is the Stage 1. Candidates have to give an Intelligence Test (Verbal & Non-Verbal) & Picture Perception Test. In PP test, slide (hazy or clear) is shown for 30 seconds & candidates have to write the story. After finishing this test, the group discussion round takes place. This sequence is commonly known as Picture Perception and Discussion Test (PPDT). Intelligence Test: It comprises of both; verbal and non-verbal questions. It is a written test which includes multiple choice questions. The time allotted to answering each question is 30 seconds. Picture Perception and Discussion Test (PP & DT): This test includes story writing and discussion. A picture will be shown to the candidates for 30 seconds and candidates have to write a story based on the picture in 3 minutes. Thematic Apperception Test (TAT): It is called as Picture Story writing. This test is very similar to PPDT. In this test, about 11 pictures will be shown. Each picture will be displayed just for 30 seconds after that candidates have to write a story based on the picture within 4 minutes. After 4 minutes another picture will be displayed and the same procedure will be followed till the last slide. The twelfth slide will be blank where a candidate is supposed to write any story of their own choice. Word Association Test (WAT): It is the second psychological test of SSB selection procedure. In this test, 60 words will be shown back to back for a period of 50 seconds. Candidates have to write the first thought that comes to their mind for those words. Situation Reaction Test (SRT): In this test, candidates will get a booklet with 60 situations written on it. Candidates have to write their responses based on those 60 situations. Self Description Test (SD): In this test, candidates have to write their opinion about their parents, themselves, friends, teachers & others. The time will be allotted 15 minutes. Group Discussion: In this round, a certain situation or topic (mostly current affairs) is given to a group of candidates. They are expected to discuss the various aspects of the issue. Group Task Officer observes each candidate during the course of the group discussion. Group Planning Exercise (Military Planning Exercise): In this round, a model of real life practical circumstances is presented to a group of applicants. They have to write their own plan of action for the mentioned problem. Progressive Group Tasks (PGT): In this round, the group of candidates has to cross some obstacles with the help of supporting materials such as rope, plank, wood log etc. Half Group Tasks: This round is same as PGT but the numbers of group members will half. Candidates get more chance to show their potential. Individual Obstacles: In this round, candidates are required to attempt 10 obstacles individually. Group Obstacles Race or Snake Race: In this round, all group members will compete to the other groups. Candidates are required to cross certain obstacles with the snake-like rope. Command Task: In this task, an aspirant will be a commander. He will be required to cross some obstacles with the help of 2-3 subordinates. Lecturette: In this round, each individual has to give a lecture for 3 minutes on a topic selected by them. Final Group Task: It is same as PGT. Candidates have another chance to show their potential. On the same day, the candidate’s interview will be conducted. It involves a personal conversation with an Interviewing Officers. On the final day, candidates & all the SSB board member sit together and have a chat to the candidates to ask a few general questions. The conference is just to decide whether you recommend as an officer in Indian defense forces or not. Candidates are required to come before the complete Board of Examiners, which is consisted of President, Deputy President, all the GTOs, all the psychologists and Technical Officer. Within an hour, the SSB result will be declared after completion of the board meeting. Selected candidates undergo medical test for further 3 or 5 days. After qualifying candidate’s medical test, the final merit list will be announced. Self- Awareness: Prepare for it beforehand. The examiner usually looks for your ability to self-analyze, the aim of your life & determination, your thinking and mentality about your parents, friends, family, teachers, neighbors and other. Write everything you know about yourself and your near ones. It helps you to know your positive, negative & achievements. Personality Development: It is not enough that you should be a very intelligent person but you have to be strong, mature & possess a well-developed personality. Make communication with the people which help you to in lecturette round & also in every task that requires public speaking. While writing your story and just after completing it, don’t look at the officers. In GD, don’t argue with others: allow them to speak. Wait for the right time to put your strong points of the story. If you have any other query about SSB interview, you can leave your comments below. How many times can we write NDA exam? Please tell me! I am engineering student has finished my 3rd year, what are the dates to apply online? Which region is good for ssb for nda?? Sir, JEE (mains) score is mandatory for ssb 2017, both navy and army? May we replied hindi in ssb exam. Actually i am doing M.S(software engineering)integrated course (5yrs). Wheather i can also able to apply for Airforce exams? If we want to give ssb before class 12 finals can we appear for it or no. Like one month before the board exams of class 12. NAD cha form ksas fill karaycha? form fill karaychi website? Arihant guide for NDA and NA is sufficient for preparation of written examination. The best book for preparation of SSB is “let’s crack ssb” from ssb crack. when will be the NDA1 2017 written exam result declared.? Results will be declared till 14-15 of July. sir it is written that to bring call letter what is it? The letter which is sent to you for the SSB. Sir interview ki bengali language ao hobe??? Sir, Pl let me know when NDA-I result will be declared ?? Pl. let me know the date. Result will be declared soon whenever it announced we will update in our website. When will nda1 result announced. At what date nda1 result will announced. Will be announced in coming week. I have eyesight .Am I able to clear medical test. In which language we have to write the story or about our parents or about our friends in ssb interview? What type of pictures will be shown by the ssb of the candidate. Please reply me. Am I eligible for AFCAT exam? What is the procedure to ssb now ? What I shall do now ? If I dont have the fluency of speaking english..will my marks be deducted? Sir,my D.O.B has-been submitted wrong in the AFCAT application form.what I have to do now for SSB . you can join air force through AFCAT exam. My ssb held on 23 June at bangalore but I don’t have a original educational documents. Because of I’m serving at CRPF and when I was enrol in that service my documents were submitted. My documents will get after 1 year..
Sir,I am in class 11 till now.But after one week i get my result and then i will be in class 12.My ques is that while i give the NDA2 2017,And if i will pass in NDA2 then in SSB what should i do.At that time i have n’t my class 12 board certificate as because SSB interview of NDA2 always be held in the month of Feb.But as per NDA the eligibility is 10+2 certificate from any recognised board or university. I couldn’t get my marksheet. I have my only class 10 and 11 marksheet. So i could give the SSB?? I m Also waiting for date of ssb interview.. Do we have to register online after getting the result of written xam?? Sir can we use english as well as hindi to describe our story. It will be announced later. You can appear in ACC & PC recruitment process. What will be the timings for the exam ? sir , i m percuing b.tech 3rd year in civil engineering from kuk ..and i want to joining the army through ssb so please i want guidance about ssb …how can i apply in ssb ???? Sir i send the all applications to the ssb for 2017 recruitment s…..but I didn’t get any authentication…. For NDA I, candidates born not before 2nd July, 1998 and not later than 1st July, 2001 are eligible to apply. Sir I mean studying currently in 11 the CBSE board. May I eligible to apply NDA (1) 2017.when will SSB interview conducted for this. I am very interested in NDA exam and I am very excited about the position of assistant professor department of health and safety officer and I am joining the team NDA and I haveget this job. sir I am the student of H.S 1st year.my stream is science. my weight is 56 kg,my height is 165 cm. can I join in ssb? Sir, i am in class 11th this year , while appearing class 12th, may i join the SSB or NDA examinations? Sir how much percentage is required in class 11 and 12 to join our indian army? Also sir i am in K.V.AFS.KUMBHIRGRAM(CBSE) and i got 9.2 cgpa in my 10th class is it ok……? ?